We all want to know what kind of workout is the most efficient and creates the best results. Well, you’ve found it! 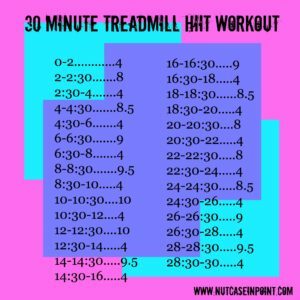 High-Intensity Interval Training (HIIT) is an alternation of high and low intensity exercises or high intensity exercises with short periods of rest. The question might arise, why would I WANT to do high intensity when I can perform moderate intensity on the treadmill for longer? One of the greatest benefits with HIIT is excess post-exercise oxygen consumption (EPOC). EPOC is considered to be about the two hour period after your workout where your body is expending energy to restore itself back to its pre-workout state. Due to the nature of activity performed in HIIT, the EPOC adds about 6-15% additional calories to the overall workout energy expenditure! Have I sold you yet? If not, there’s more! HIIT has a number of benefits in addition to the one previously stated. These benefits include: build endurance, boost metabolism, burn fat and calories in shorter period of time, strengthen cardiovascular system, develop mental toughness, no equipment required, and you can create your own workout! 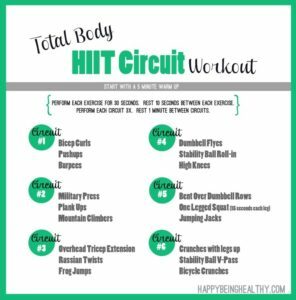 Here’s a how-to on creating your own HIIT workout to fit your needs. The main thing to remember is to alternate short bursts of very high intensity periods with periods of recovery/low intensity. The high intensity periods should be performed at 80-95% of your maximum heart rate (HR) and the recovery periods should be performed at 40-50% of your maximum HR. You can start by choosing the length of your workout; the typical length is anywhere from 8 to 30 minutes. Next, select your intervals; common intervals include a ratio of 1:1, 45:15, 50:10, 60:30, or Tabata, which is 20 seconds exercise, 10 seconds recovery. The last step is to pick your exercises. As far as exercises go, be creative and mix things up. These can include sprints on a treadmill, weighted exercise, or bodyweight exercises such as: burpees, squats, pushups and mountain climbers. 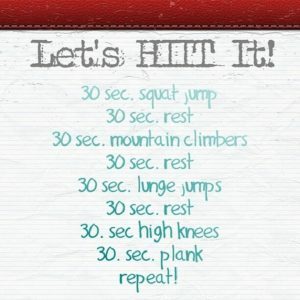 The pictures below are example HIIT workouts for you to try!